Qihoo 360 has finally got its $9.3 billion buyout, against the odds. The biggest take-private of a U.S.-listed Chinese company has been finalised despite funding challenges. Tapping retail investors may have helped raise the new equity needed. But others eyeing similar buyouts may find the journey harder. After a year of stock market volatility in China, raising the funds to take antivirus and search group Qihoo private was no mean feat. Even after securing $3.4 billion in debt to fund the deal, the investor group led by Chief Executive Zhou Hongyi has still had to raise $5.9 billion in new equity. Back in June, when the management buyout offer was first announced, mainland stocks were hitting seven-year highs. Sourcing billions in funds to take foreign-listed companies private, with the idea of relisting them on China’s own stock market, seemed much more straightforward. Since then, the Shanghai benchmark index has fallen 30 percent and regulators have only just loosened a ban on new listings. Zhou and his consortium, which includes Ping An Insurance and Sequoia Capital China, likely got a much-needed boost from China’s retail investors. Wealth management products linked to Qihoo’s privatisation were being advertised on the country’s most popular chat app. One, reviewed by Breakingviews, offered prospective investors returns of up to five times. For the two dozen or so U.S.-listed groups that have announced take-private plans, repeating Qihoo’s funding feat may not be as simple. While a big deal, it’s also a big name, and has the scale to attract investors even when the market is weak. As for the twenty-plus peers waiting to follow Qihoo back home, they may not have the heft to defy such odds. 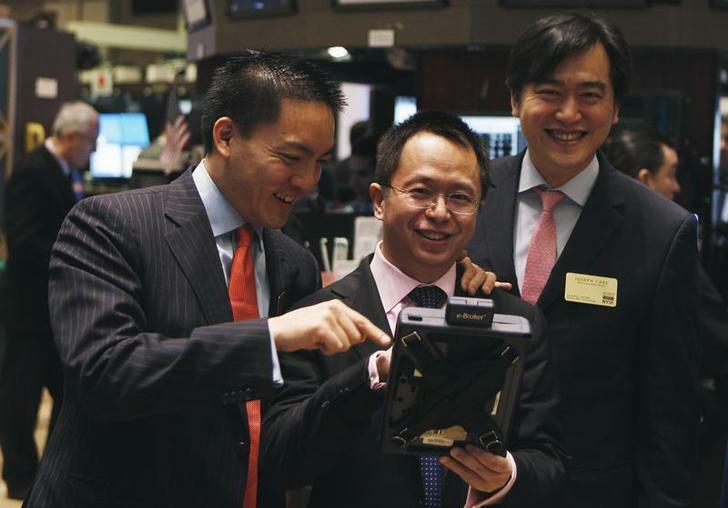 Hongyi Zhou (C), Chairman and Ceo of Qihoo 360 Technology Co Ltd takes a look at a trader's handheld trading device on the floor of the New York Stock Exchange before the company's Initial Public Offering (IPO) in New York March 30, 2011. Qihoo 360 Technology, a Chinese company known for its antivirus software and search engine, agreed on Dec. 18 to be taken private by a management-led buyout group in an all-cash transaction valued at $9.3 billion, including $1.6 billion of debt. Under the terms of the definitive merger agreement, the investor consortium will pay $51.33 per ordinary share, or $77 per American Depositary Share. The price is a 16.6 percent premium over the company’s last trading price before it announced it received a non-binding offer on June 16. The buyout group will finance the deal with $3.4 billion in debt and the remaining in equity. The deal, expected to close during the first half of 2016, will need the approval of at least two-thirds of shareholder votes. Management already has approximately 61 percent of the votes. Calls to Qihoo 360 were unanswered.